Professor at the University of Virginia's Curry Education School. Chair of the Department of Human Services. Freshman at Harding College from Siloam Springs, Arkansas. 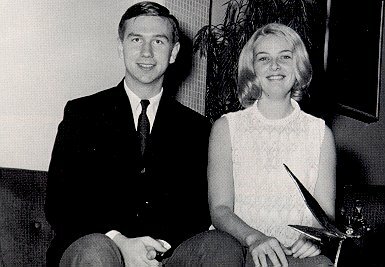 Schoolmate of Ken Starr (Picture of Ronald Edward Reeve taken with fellow Freshman Class Favorite Mary Beth Parks excerpted from 1966 Harding College Yearbook, Volume XLII, Searcy, Arkansas). Ron Reeve lived in Siloam Springs throughout his first 18 years. However, there was no hospital there in 1946; so his father drove his mother to Fayetteville, 30 miles away, for his birth. While Ken Starr was representing his class on the Student Association and out politicing with the Young Dems at Harding College, it turns out young Ronnie Reeve was quite a ladies man: seranading at girls' dorms and at stag outings with the Galaxys and dating the May Queen. It is no wonder that Ron was voted Class Favorite (Nineteen Sixty-Six Petit Jean, Volume XLII, Harding College, Searcy, Arkansas).